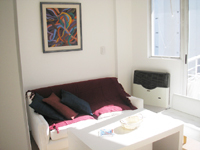 Balcony , wooden floors, cable TV,DVD, High Speed Internet, fridge,CD Stero, coffe maker , toaster, microwave,, kitchen utensils and all beding and towels. Included: included Electricity, gas, water, building fees, city taxes, cable TV, maid service once a week. Telephone bill and high speed internet.